Don’t get (over)cooked, stay off the hook. 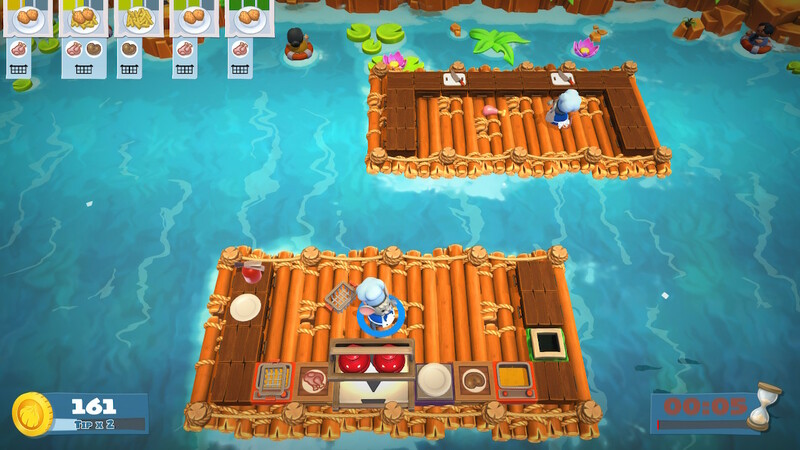 Overcooked 2 for Nintendo Switch is a strange beast. The original game laid its foundations with a solid local co-op experience and flowered from there. With the USP of the Nintendo Switch and the versatility of the Joy Con controllers, it was love at first sight, a match made in heaven. Obviously it was a bloody good game too! 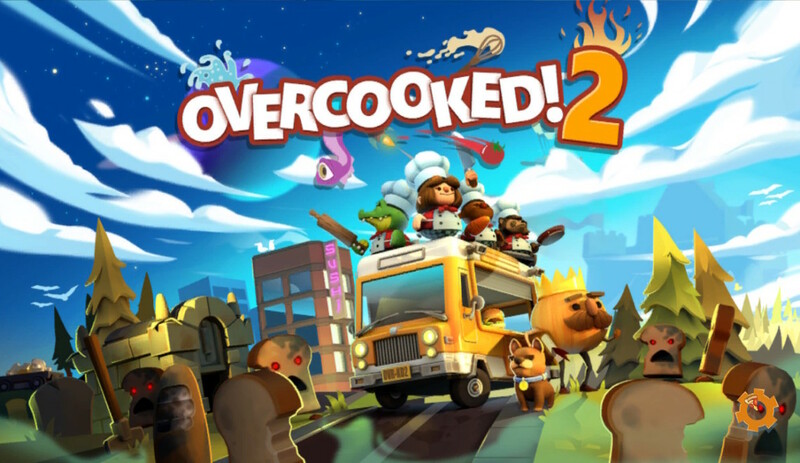 Whilst the first game felt perfect for the Switch, this time around, rather unfortunately, one glaring admission coupled with a new game mode means that this version plays second fiddle to its beefier brethren. Online play. Beautiful, brilliant and bodacious battles against the clock, trying to keep on top of the tyranny of the ticket machine. Check on – 2 nori rolls. Right, I’ll get the rice on, you prep the fish. Wrap those up and spike the check. Boom! 2 more orders of Nori, and another 1. Make that 5 more. PLATES, I need PLATES!!! Why aren’t you washing the plates. What’s that? You can’t hear a word I’m saying? Oh. There’s no voice chat. 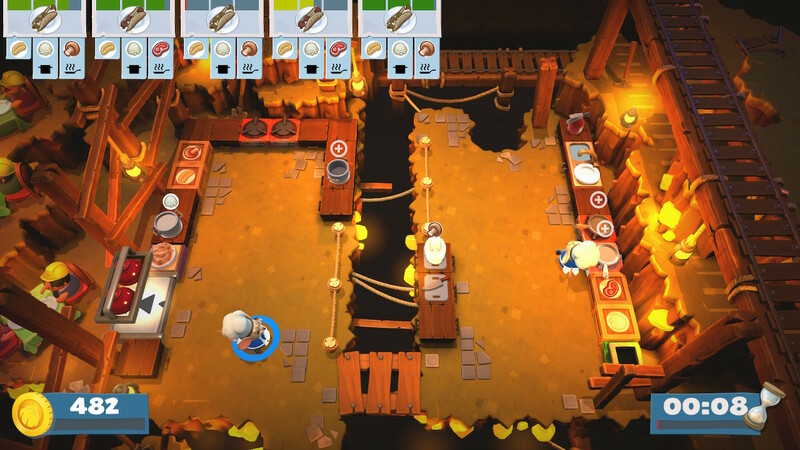 Regrettably, unlike on other consoles, Overcooked 2 relies on the use of Discord. Or the pre set emotes. And we all played Triforce Heroes right?! But it’s the sequel to A Link between worlds…. Anyway, apologies for my slight digression. I’ve worked in some pretty crumby kitchens. This one takes the biscuit. The absolutely brilliantly named Necronomnomicon has raised an army of Unbred and it’s up to the finest brigade of culinary folk since Hells Kitchen Season 7 to save the day. Obviously though, at the start of the game our team are nowhere near good enough so in typical fashion, they must swiftly learn the ropes, discover new recipes, master new techniques through the majesty of teamwork and do it all with a smile on their face, in spite of the searing heat and unrelenting pressure. You know what? I play video games to escape reality, this sounds an awful lot like real life to me. 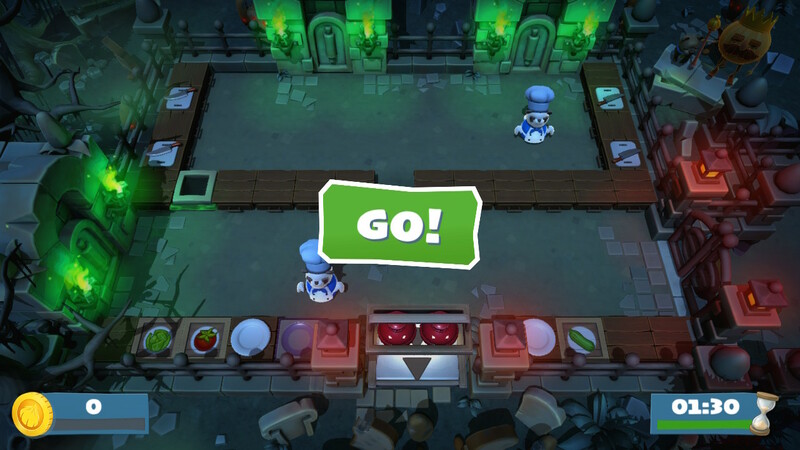 The game looks as charming as ever, but this time it comes with all the sides. 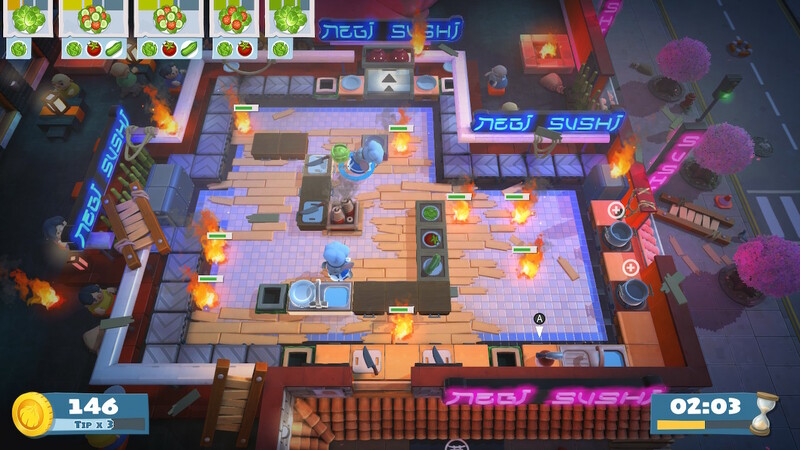 The backgrounds are more dynamic, the actual cooking arenas are quite simply nuts as they move, alter and shift during service. This makes the entire experience so much more frantic, for example, what seems like a perfectly safe level atop a hot air balloon turns sour when a freak storm breaks out and causes our chefs to crash. Much like in real life, the show must go on and service continues. As well as the truly refined graphical quality this time around, the soundtrack is equally stellar, offering a well needed morale boost during a busy rush. As anybody who has ever worked in a kitchen will tell you, the most important piece of equipment is the radio. Chefs need music to function and our little virtual virtuoso’s are no different. As you would expect from such a title, the music marries perfectly with the intensity of the service. If we all ask ourselves 1 question, straight from the off before playing this game, what would it be? 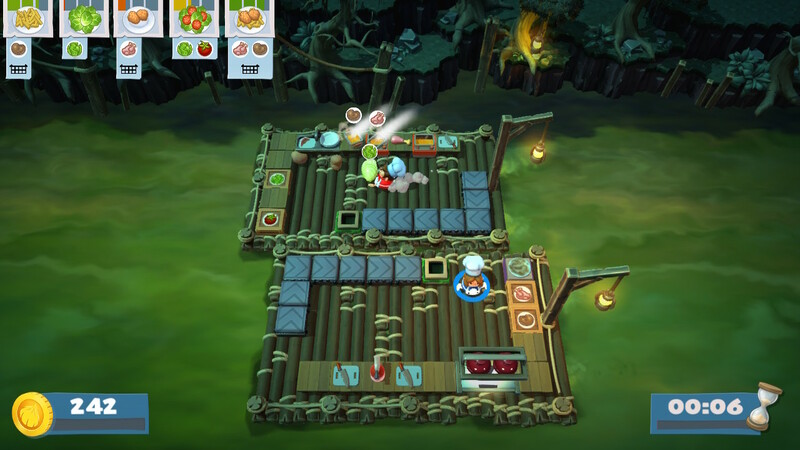 Is the imaginary video game food edible? Why is the sky less angry at night? Where are my false teeth? Probably none of these, more likely – Is it fun to play? And the answer is yes! Yes, yes, oh god yes!! On your own, it’s absolutely fine, you’re going to get your monies worth. And online, it’s better. Playing with others is an absolute blast. It can be hectic; essentially organised chaos, especially with the aforementioned voice chat issue. The real creme de la creme is still local co-op play. The addition of online multiplayer is all very well and good, a necessary evil if you like for this day and age and the world that we live in. However, words can’t adequately describe how downright stupidly funny the entire experience is. Either that or inconsequentially, my writing isn’t as attuned as I like to make apparent. I actually asked my partner if I could film us playing, to better demonstrate the hilarity, but alas, I fear that she wasn’t comfortable with this request. Much like the last time I asked to film us, I was quickly shot down. Everything is burning, I’m surrounded by fire. This is hell – An actual description from a co-worker of a kitchen I worked in. 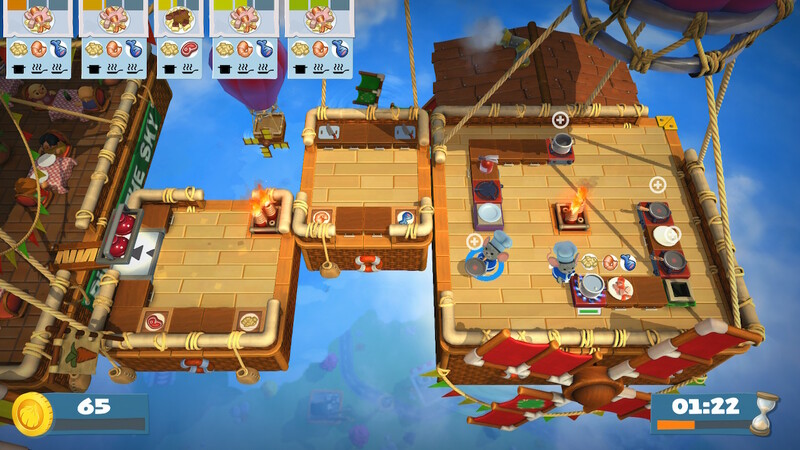 Overcooked 2 is an absolutely spectacular offering that takes everything that made the original Overcooked title so much fun and seemingly smothers it in delicious molten chocolate to make it even more delectable. The lack of voice chat when playing online is deeply frustrating, and whilst services such as Skype and Discord offer alternatives, it does feel like a missed opportunity to have not gone the Fortnite route. Offering the option to plug a headset into the console in handheld mode and be able to audibly converse with your colleagues would have made online such a deep and rewarding experience. Alas, I guess it wasn’t to be. Perhaps when the Nintendo Switch Online services launch next month, the developer can step in with a patch to add chat support. If that were to happen I would almost definitely have to alter my review accordingly. Frantic multiplayer fun, whether it be online or local. Lack of voice chat highlights a flaw still present in the Nintendo Switch after almost a year and a half on the market. Thanks to NikkiChan for providing me some much needed company online.